Part of the pleasure of wearing and giving gemstone set jewelry is the beauty of the design. We offer you a way to realize your jewelry dreams. Describe the piece you wish were yours and we'll make the wish reality. Our specialty is designing and making one-of-a-kind jewelry. One-of -a-kind jewelry to your specifications. Doing our work on site allows for good communication throughout the design and manufacturing process . Handmade: a traditional process involving a hand carved wax model, hand cast, and hand finished. This method is not as precise as a machine manufactured design but each piece is unique with its own distinct character. Fabrication: A traditional process of forming metal into wire, sheet, and assembling these into jewelry. This is the oldest of the jewelry making process dating back thousands of years. Cad cam: High-Tec computer aided design. The wax model is cut on a milling machine, more precise than hand caning and better suited to some styles of jewelry. Our design skill lets you enjoy the gold and gems you've owned for some time in new ways that suit your current Life. We listen to the specifics of your dreams. We can work with your gold and gems or you can select gems from our generous inventory. 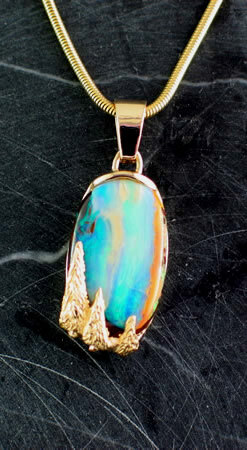 We do custom work in 14K and 18K gold, platinum and sterling silver.